Recognized for personalized care, renowned surgeons, and progressive technology, St. Luke's Hospital recently opened a new wing that integrates technology with the healing powers of nature. This wing delivers a post-op recovery and rehabilitation experience on par with the high-tech surgeries - especially the advanced orthopedic procedures - that have been attracting patients from across the region and across the nation to St. Luke's Hospital. St. Luke's Hospital provides a unique and successful treatment for patients who suffer with lymphedema, a buildup of fluid in extremities causing pain and discomfort. Patients suffering from lymphedema can now receive relief with Manual Lymph Drainage (MLD) therapy through St. Luke's Hospital Outpatient Rehabilitation Services, so patients no longer have to travel out of town to receive this treatment. MLD is a very gentle type of massage therapy used to drain excess fluid from the body and improve the overall functioning of the lymphatic (immune) system. MLD is combined with a program of compression bandaging, remedial exercise, and patient education for self-care after discharge. A physician referral is required for MLD therapy, and patients must remain under close medical supervision. Anyone who exhibits swelling resulting from damage to the lymph system or chronic venous insufficiency resulting from surgery, chemotherapy or radiation treatment is encouraged to consult their physician about the effectiveness of this treatment for their condition. Lymphedema is a chronic condition, so maintenance treatment and lifestyle changes to keep the disease in check are vital. St. Luke's Outpatient Rehab offers a Balance and Fall Risk Screening and Conditioning Program using the BioDex Balance System. The Biodex Balance System enables the rehabilitation team at St. Luke's Hospital to perform balance testing and identify fall risk candidates, determine ankle and knee status, and determine limits of stability. This system also provides balance training including stabilization exercise, range of motion exercise, and weight shift exercises. This system is combined with traditional physical therapy services such as stretches, exercises and neuomuscular re-education to help patients return to their age appropriate level of balance and to regain independence in their daily tasks. Neurological problems such as strokes, Parkinson's Disease, head injuries, etc. We also assist with one-on-one self-care needs to keep our patients as functional as possible. We look at muscoskeletal, cognitive and neurological needs in addition to adaptive methods and techniques after an injury. Hand therapy is the discipline that addresses injuries and conditions of the hand, wrist, elbow and shoulder. Certified hand therapists are either occupational or physical therapists who have specialized training in treating upper extremity conditions. Through advanced study and continued professional development, a certified hand therapist must pass a rigorous exam and demonstrate competency every five years. Our hand therapists work closely with physicians and clients to provide individualized care. Treatment often begins within days of the injury or surgery and continues until the client has returned to work and/or a productive lifestyle. 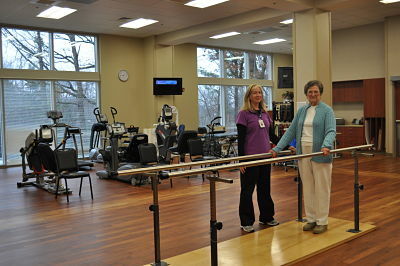 St. Luke's Hospital's Rehabilitation Center is located on the campus of St. Luke's Hospital. Swallowing evaluation and treatment-for individuals who get choked or strangled or cough when eating or drinking. Also those who feel food is sticking in the throat or who have trouble chewing foods. Modified Barium Swallow Test-an x-ray that shows the complete swallowing process when given a variety of food and liquid consistencies. Augmentative communication-alternative means of communicating without the use of voice. For more information about the St. Luke's Hospital Rehabilitation Center, please contact Scott McDermott at (828) 894-8419 or email.